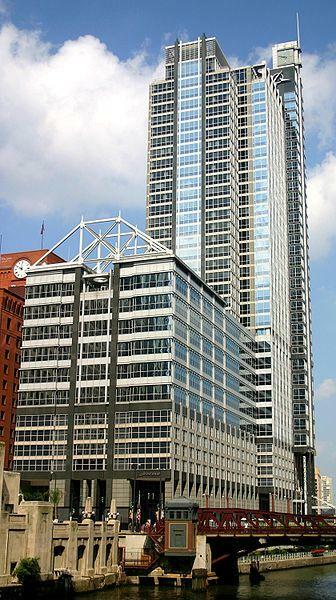 The corporate headquarters in a downtown skyscraper took a beating during the 70s, 80s, and 90s as America’s inner cities went into decline. Why locate in a decaying, lawless, dysfunctional urban setting that seemed destined for the scrap heap when the shiny suburbs beckoned? Indeed, companies increasingly vacated downtowns for massive suburban office campuses, frequently in idyllic, pastoral settings where employees would exist in a cocooned bubble without any but approved distractions such as on site gyms, dry cleaning, cafeterias, and daycare. Eight years before 9/11, financial services and commercial real estate were superseded as driving forces in the New York economy by the restaurants appearing in boldface in Zagat’s. The exodus of corporations from New York during the near-depression of 1992-95 was stanched by a single thing: lunch. The C.E.O.’s would do anything rather than give up the daily celebrations of their eminence at eateries in the town where the wining and dining were as good azagats. (I know, I know; just read it out loud.) The case could be made that any post-9/11 federal appropriations to prop up business in New York should go first to the places where you can get Chilean sea bass with a Georgia plum marmalade glaze on a bed of mashed Hayman potatoes laced with leeks, broccoli rabe and emulsion of braised Vidalia onions infused with Marsala vinegar. Many CEOs might prefer to be close to home, but others enjoyed hobnobbing with their peers and getting treated like royalty at the Four Seasons. Yet even as many corporate headquarters were leaving and as Time magazine published its “Rotting of the Big Apple” cover in 1990, it was clear major change was already afoot. The cleanup had begun in the mid-1980s and by the 90s Americas biggest cities were on the way back. How could the urban center be coming back while headquarters bled away? The answer was the rise of the global economy and the services based “global city”. Saskia Sassen and other writers pioneered the analysis of this new entity. In this world the complexities of the global economy generated demand for new forms of financial and producer services needed to manage and control the far flung networks of the global corporation. These highly specialized services providers were subject to clustering economics and concentrated in large urban centers like New York, London, and Chicago where they provided a new type of urban economic vitality. This not only provided an explanation for why urban centers could economically rebound while simultaneously losing headquarters, but from a civic marketing perspective it provided a justification for pooh-poohing the loss of HQs as much ado about nothing. Headquarters were yesterday’s news anyway. Except that they weren’t. In recent years we’ve seen increasing evidence of the return of the corporate headquarters to the global city, a phenomenon I identified in 2008. Today the “back to the city” theme for corporations is much written about, and the headquarters is once again conveniently seen as a signifier of urban strength. But in most cases this is not the old monolithic headquarters of yore, with their thousands of employees. Rather this takes the form of an “executive headquarters.” That is, a headquarters consisting largely of the C-suite and a small number of other very senior leaders and support staff. These have been around for a while, but traditionally existing to serve the desire of the CEO to live in a particular city. Men’s Wearhouse established headquarters in Fremont, CA for example, but most of the corporate employees are located in Houston. Lincoln National moved its executive headquarters to Philadelphia from Ft. Wayne, IN but the distribution of employment was barely affected. Both were CEO living preference driven. The people in “executive headquarters” are precisely those who most need proximity to the global city service providers that increasingly form a key part of company operations. Also, recruiting executive talent and proximity to airports play a role. And when companies want to think in a totally global manner, they can want to have their main office physically separate from any particular operating location. There are numerous examples. In Chicago alone, MillerCoors moved its top staff from Milwaukee. Mead Johnson Nutrionals established an executive headquarters in the suburbs away from its main Evansville, IN base. Boeing’s move to Chicago from Seattle can be seen in the same light. And just recently agribusiness giant ADM announced it was moving its HQ from Decatur, IL to Chicago. Between 40 and 60 people will work in the corporate offices, most of them in new positions. Evansville will retain the company’s operations in research and development, U.S. sales and marketing and information management, as well as a bulk of the finance and human-resources departments, Paradossi said. Mead Johnson’s liquid products will continue to be made in Evansville, he said. Note the stated reasons for the move, as well as the small number of people involved. The ADM move is similar, with only about 100 jobs initially. This suggests that while headquarters are in some cases coming back to the global city, they aren’t brining many jobs. Also, many second tier business centers like Indianapolis continue to see their downtown job base hollowed out apart from hot sectors like technology. The executive headquarters is one more example of the increasing bifurcation of America’s elite cities. A handful of top executives gather in America’s capitals of capitalism while the good paying core of the old headquarters – including many upper middle class positions – remain in more workaday cities. This but one example of the “growth without growth” model in which cities dispense with “old fashioned” notions like population and job growth in favor of higher per capita GDP and income in which parts of cities thrive by becoming downtown versions of the exclusive gated subdivision. A few cases have gone beyond this, with even more wholesale moves back to the core. United Airlines moved 3,000 to the Chicago Loop from Elk Grove Village. And Google is moving 2,500 people from Libertyville as a result of the Motorola Mobility purchase. (This unit is already being sold to Lenovo, however). These more substantial moves could bring more bread and butter jobs. But as a recent column in the Economist noted, investors are putting huge pressures on companies to slim down bloated overheads. This does not bode well for bringing middle-skilled jobs to expensive headquarters locations. Additionally, the rise of telecommuting the and 1099 economy, just in time offices, co-working spaces, etc. are transforming the way people work and putting further pressure on the traditional HQ. Office floor plates are expensive, and increasing numbers of people no longer want to spend their days toiling away in the salt mines of cubicle farms anyway. Where does this lead? If there’s one thing the last few decades have shown it’s that the only constant is constant change. With unpredictable market dynamics and various iterations of the cycle of reincarnation (centralizing vs. decentralizing, etc), even the shift to selected downtowns may bring fewer benefits to the urban economy than imagined, and could ultimately accelerate the bifurcation between a small elite population and largely poor communities around them. Boeing Chicago photo by J. Crocker. Submitted by chaseweston on Fri, 05/23/2014 - 04:14. This blog is very useful for those who want to get success in their life and career oriented. Built a career and get success is very difficult and many people ready to do everything for it. Training and coaching become very common now days to choose a right career path. This blog gives us inspiration and tips for making career. Submitted by Julien Meyrat on Tue, 04/15/2014 - 16:26. Your mention of Boeing's HQ relocation to Chicago would tear open a deep wound shared by those proud Dallas-ites who can remember. If you recall, Boeing had shortlisted three cities for their new HQ: Chicago, Denver and Dallas. Dallas boosters were pretty confident of their chances, as they were already home to 2 of the biggest airline companies in the world (American and Southwest), possessed one of the world's busiest airports, and also featured other major aeronautic companies with heavy footprints in the region (eg. Lockheed, Bell Helicopter) as well as military contractors such as Raytheon. And of course, the tax and regulatory climate was more preferable than what they had in Illinois. So what happened? It turns out that Boeing's Executives needed a nice place "to do lunch": that is, excellent cultural amenities that more traditional urban centers had- better food, better art, better urban experiences and spaces. Dallas had some of those things, but they weren't nearly as established and sophisticated as Chicago (and Denver had almost none of those things 15 years ago). The loss of Boeing's new HQ had an important effect on Dallas's city leadership, redirecting efforts towards making the city more appealing for the elite who demanded high culture and one of a kind urban experiences. The recently completed Arts District is partly a result of that as well as newer high-density residential districts such as Victory Park. The successful Klyde Warren "Deck" Park over the freeway is also part of this strategy. When I found myself in Chicago a year or two later, I noticed how Boeing's presence in its new tower seemed kind of understated, looking like one of hundreds of other corporate towers that wasn't even on the most prominent site downtown (unless you think the West Loop is where it's at). It was obvious that its footprint was relatively small, and that Dallas didn't miss out on all that many workers, anyway. Getting an HQ seems to be increasingly about cache and presenting a cosmopolitan image, not animating downtown life in any meaningful sense.